A magical story about friendship and difference by Pippa Goodhart for Egmont's red banana series. Jess and her blacksmith father have a dragon called Huff to fire the forge. They live in a mountain town, fenced to keep out the valley people. But it has no gate. The King charges Jess's father with making a strong gate for the town. Huff is getting too old to provide enough fire, so they get a new, red dragon, who they call Puff. They work day and night to finish the gate for the King. Then Puff becomes ill, and it's only with the help of a boy from the valley that Jess learns how to heal her and, excitingly, how to fly on her! 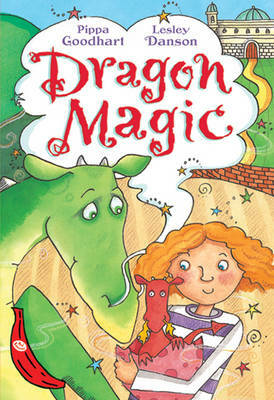 Told in simple, engaging language, this fun, magical story is perfect for developing readers. Red bananas are chapter books for newly fluent readers, suitable for NC Level 3 readers. They are carefully designed illustrated books for both entertainment and education, supporting children's understanding of how to read longer books. Red bananas introduce similes and wordplay to encourage an understanding of more literary concepts.